Enjoying some personal recharge time in San Diego, I met a couple of committed walkers who taught me some great insights into authenticity as a personal and institutional lifestyle. I was climbing Cowles Mountain, the highest spot in San Diego county. It’s a great spot to enjoy the sunrise — an hour up, 15 minutes down. 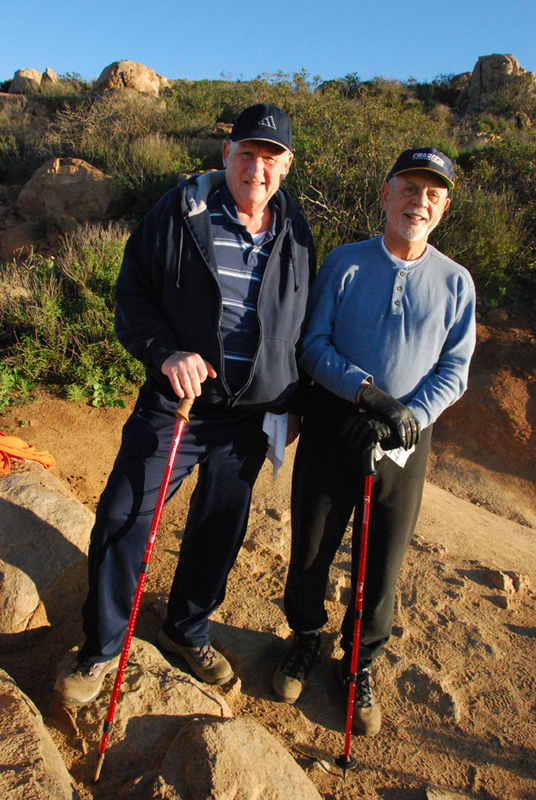 While on the way, I stopped to rest and as Del (on the right) passed with his friend, we struck up a conversation. I asked him about walking as metaphor of life, and he hit me right between the eyes with, as Kenny Rogers put it, an ace that I could keep. Del’s formula? Del’s comments inspired me with a fresh insight into both personal and institutional authenticity. Being “me”, honestly projecting who I am, is not enough if I want to be perceived as authentic — if I want to be an organic and productive enterprise. I also have to respond to “you”. I must be committed to self-improvement, and work that out through a cycle of receiving and sending, give and take, listening and expressing. The brand of an institution does not emerge from what it repeats about itself. As John Moore said in Brand Autopsy recently, it flows from being, not “branding”. Being “me”, personally or institutionally, involves a recognition that if a “me” has value because of my story, my unique experiences and perspective, then every “you” has value, too. If one individual is golden, a diverse community brings infinite riches. If there were only one university it would be a boring and provincial world of ideas. But Oxford has greater value because there is Cambridge. Harvard is interesting because it shares many qualities with the other Ivies, as well as because of the nuances which differentiate it. Each “me” becomes actualized as an authentic brand because of its response to its environment. I can attempt to assert my independence from my peers, but when I do so it only cheapens my actual brand, the authentic “me” which is not what I think of myself, but what I actually am as an organic member of a community of interrelated, interdependent organisms. My ability to project a distinct perspective, a valuable set of values, tarnishes whenever I grow sluggish in my efforts to be accountable. In fact, I would argue that if there is one foot more important than another in Del’s metaphor, it would be the rethinking foot. By rethinking and changing as rapidly as possible to changing conditions and needs, I earn the right to assert my identity as valuable, as useful, as worth consideration. I have a valid reason to hold forth my brand. And I have a decent chance, thus, of my brand being perceived as authentic. Thanks, Del, for your helpful insight! I used my days of travel to gather some inspiration. “The thinking of the person who operates”… Yes, everything in the cinematic arts hinges on the thinking of the artist, or newsman, or journalist, who controls the camera. Which lens? Which angle? Whose reaction? A good case in point for me recently came while watching The Truman Show. Near the end of the movie, when Truman hits the sky-wall, Peter Weir (who gave us Witness, Dead Poets Society, and Fearless) chose to show the moment of anguish as a medium shot, from behind. Without seeing his face, we are left with only his body language, his fruitless attempts to break out of his prison with fists and body slams. When Jim Carrey finally spins around to reveal the agony in his face, it is all the more moving and poignant. This is directorial thought at its best. Another example is in the movie Sleepers. Jason Patric’s character finally reveals to the priest, Father Bobby (played by Robert De Niro), the dark secrets that the boys have been living with since their incarceration for a childish prank. Barry Levinson directs that instead of playing Patric’s face and hearing his actual dialogue, we lock on a closeup of De Niro. For something like 30 seconds (and it feels like minutes) the audio goes into “hyper-reality” — the sound of words without the intelligibility — and we read the pain in a sympathetic face, as De Niro comes to grips with the horror the boy experienced in jail. It’s a master stroke. Levinson, like Weir, is a director who thinks about the truth, about the complexities and nuances of human reality. In this case it’s about how it could be more “moral” for a priest to lie under oath than to put the murder of a soulless man higher than the murder of a boy’s soul. The best of cinematic storytelling occurs when thought is paramount…. when the goal is not to scintillate (explosions, car chases, skin) but to ruminate. With excellent actors, the thinking occurs when they and the director invest time in the back-story, developing the inner motivation and character dynamics that make each moment of word and action “realistic”. In documentary-style story-telling, the thinking occurs during shooting and editing, when the cameraman senses what is relevant or transcendant in what is unfolding, and chooses to focus on the decisive moment. Like a miner panning for gold, he looks for the glittering nuggets, and then swirls them in the pan until the mud clears away. And then, in the editing process, he thinks carefully about how to sequence, juxtapose, and set the best moments into a story that breathes with life and authenticity. We’ve all seen boring documentaries. We’ve all seen bad movies. And the term “college video” has earned its own category of disregard. It is in the thinking, not the production values, that the fault can be found. In fact, I think that people will forgive bad production values if the story is authentic and the thinking quality is evident. Which is why all the talk about cameras and formats among “video guys” is so meaningless and beside-the-point. What matters is the thinking of the cameraman and the editor. Period. To use Cartier-Bresson’s self-description, the successful communicator of an institutional ethos needs “the velvet hand, the hawk’s eye”. It’s not a skill as much as a state of mind that I aspire to … the mind of a painter of birds. Patient, observant, unobtrusive, in love with his subject. Those are the kinds of artistry that inspire me. 1. If it’s produced can it be authentic? Yes, if the assembled moments are authentically “found moments” or else “realistic moments” which communicate a truth about some aspect of the human condition. 2. Can it be authentic if green screen or other devices are used? Yes, if the visuals convey a truth with a sense of perspective and appropriate emotion. 3. Can it be authentic if it’s rehearsed? Yes … Hollywood does this all the time. Here, you start with authentic dialog, true to the character, to the situation, to human nature. Then you rehearse it until the actor can deliver it in character, in the moment, as though it was authenticly caught by a candid camera. 4. Can it be unrehearsed, unmediated, unedited, and still be inauthentic? YES! It can be a come-on, a false or extremely partial view into a person, a misrepresentation of their feelings, a statement of what they think you want to hear. 5. If it’s authentic, does it have intrinsic value? No, because it can also be authentically banal, boring, derivative, destructive, shocking, titillating, or horrifying…. and thus other than perhaps being a form of art, pretty much worthless in spite of its authenticity. Thanks, Becky, for raising these questions. I welcome comments on these perspectives. Near the end a college-age student asks, “As long as you know it’s fake, what difference does it make?” He seems to be in the minority: most folks want to feel like what they are watching is authentic.